SAULT STE. MARIE, MI – After being shut down for its annual winter maintenance since late January, there was a flurry of activity at Michigan’s Soo Locks this week as two of the huge, empty chambers were refilled with 73 million gallons of water in preparation for Monday, March 25, which is opening day of the 2019 navigation season. For Great Lakes ship enthusiasts, this ritual is the true first sign of spring. 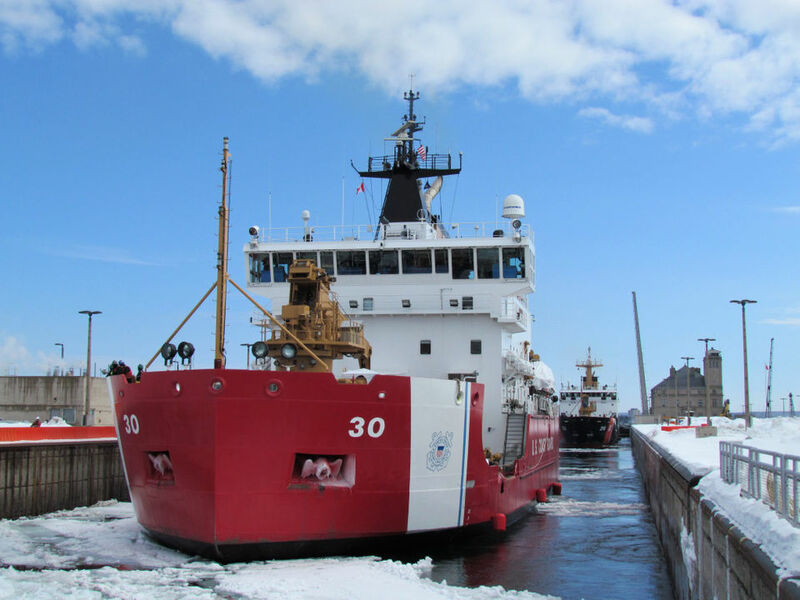 With the Soo’s biggest lock – the Poe Lock – refilled and ready, the first vessels through were a trio of Coast Guard that headed out Tuesday on an ice-breaking mission in partially-frozen Lake Superior. Two of the cutters – the Mackinaw and the Alder – are U.S. Coast Guard ships. The third is the Samuel Risley, a Canadian Coast Guard vessel. The three motored into the Poe Lock together and locked through. When they were out into Lake Superior, the strong-hulled ships began cutting tracks in the ice that will help huge cargo vessels start crossing the waters later this week as they leave their ports, heading toward the Soo Locks. The locks, located in the St. Marys River, help ships and boats move from the lower-level waters of Lake Huron to the higher-level entrance to Lake Superior. Only two of the four locks are currently in use. A new lock is expected to be added in the future. The three big cutters working in Lake Superior this week will soon be joined by other vessels, the U.S. Coast Guard said. They will be working areas including Michigan’s Whitefish Bay and Duluth, Minn. before breaking ice in western Lake Superior ports like Silver Bay, Two Harbors and then Thunder Bay in Ontario, Canada. By the end of March, they expect to break out any ice left near Marquette and the Keweenaw Waterway. This week, the U.S. Army Corps of Engineers’ Detroit District, which oversees the Soo Locks, has shared several photos of how their team has prepped the Poe Lock for the new season. They’ve also provided descriptions to go along with the work being shown in each image. For more information on the Soo Locks Opening Day festivities, check here.